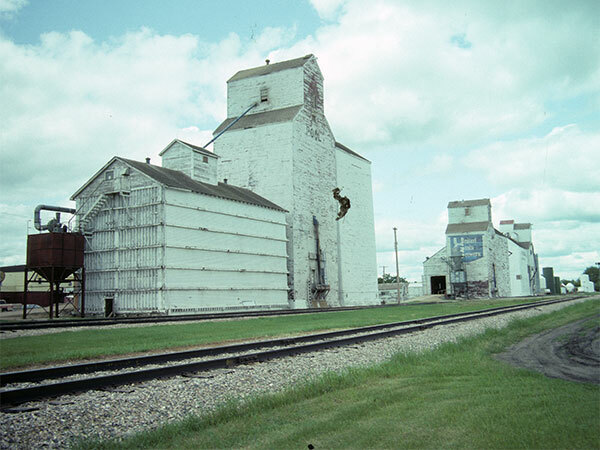 Built in 1954, a 111,500-bushel wooden grain elevator and its two annexes in Swan Lake, on the CNR Carman Subdivision in the Municipality of Lorne, were bought from Federal Grain in 1960 by Manitoba Pool Elevators. In 1971, they were traded to United Grain Growers. Source: Historic Resources Branch, Grain Elevator Inventory, slide 2021.